The J-Pole antenna is a 0.75 wavelength (Lambda) long vertical antenna consisting of a main radiator 0.5 wavelength long fed by a 0.25 wavelength section folded back on itself (this section of the antenna does not radiate any significant power). The feed-point/tap is located approximately 0.03 wavelength up from the bottom of the 0.25 wavelength section. This design makes the antenna look like a "J" hence the name "J-Pole." The antenna is balanced and is band specific. The J-Pole is a popular antenna for use on the VHF and UHF bands as it has a very low take-off/elevation angle of approximately 10 degrees (if constructed and mounted correctly) with an approximate gain of 3.13 dBi or 1 dBd (1 dB gain over a dipole at the same height). Calculated as follows: 3.13 dBi - 2.15 dB = 0.98 dBd. This makes it ideal for reaching repeater stations on the distant horizon. Whereas a 0.5 wavelength vertical antenna with no radials has a typical take-off/elevation angle of approximately 18 degrees. There is no reason why a J-Pole cannot be used on HF, however it does become very long for high-frequency (HF) bands below the 10 meter Band. It is important to note that the antenna should be mounted at least 0.25 wavelength (2.722 m) above the ground and 0.25 wavelength from any nearby reflective objects. Mounting it near reflective objects will affect the radiation pattern. 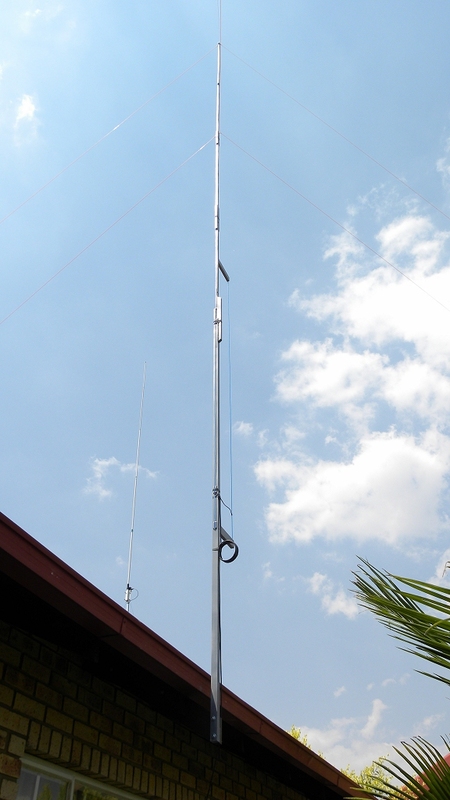 The mast to which the antenna is mounted must be non-metallic; material such as wood or PVC pipe is ideal. The centre conductor of the coax is connected to the longest side and the coax braid is connected to the shortest side of the antenna. As the antenna is balanced a current Balun consisting of 7 turns of coax close wound side-by-side with an air-core with a diameter of approximately 12 cm must be used and mounted near the feed point. 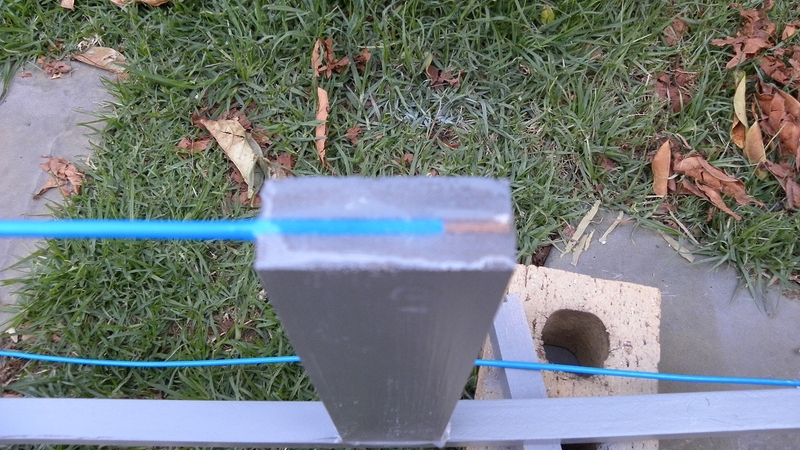 Solder the wire joins in place and insulate using self amalgamating tape. I have successfully built the antenna for use on the 11 meter Band using insulated copper wire mounted to a wood mast with the bottom of the 0.25 wavelength section 3.6 meters above the ground. I have compared the J-Pole antenna to a 0.5 wavelength vertical antenna with no radials mounted at the same height and found that both antennas perform similarly; I did however find that a significant amount of stations did come in at least 1 to 2 S-Units stronger. This is probably due to the lower take-off/elevation angle of the J-Pole. The J-Pole antenna has an omni-directional radiation pattern (indicated in figure 1) and consists of a main lobe carrying most of the power at approximately 10 degrees above the horizon with another secondary lobe at reduced power located at approximately 38 degrees above the horizon. The beam width of the main lobe at the -3 dB points is approximately 42 degrees. The J-Pole is relatively easy to construct and is semi-stealthy as it is constructed with thin insulated copper wire. The most visible part of the antenna is the wood mast. For this design I used standard PVC insulated electrical copper wire. With respect to RF, the insulation causes the wire to appear longer than it really is, this is caused by a phenomenon called "velocity factor." This has been taken into account and the dimensions I use here have been decreased by 6 % (0.94) which is the velocity factor of standard PVC insulated electrical copper wire (refer to figure 2). The band width of this J-Pole is 0.700 MHz at the 1:1.5 VSWR points. I measured the VSWR of the antenna and found it to be less than 1:1.1 at 27.500 MHz and 1:1.5 at 27.150 MHz and 27.850 MHz respectively (refer to figure 3). To adjust/tune the VSWR move the feed-point up or down (moving it up results in the VSWR lowest point to move up in frequency whereas moving it down results in the VSWR lowest point to move down in frequency). Both the centre conductor and braid of the coax need to have the same distance to the bottom of the antenna, so they need to be moved up and down together. Most vertical end-fed antennas suffer from a common problem, wet ground influences their VSWR. 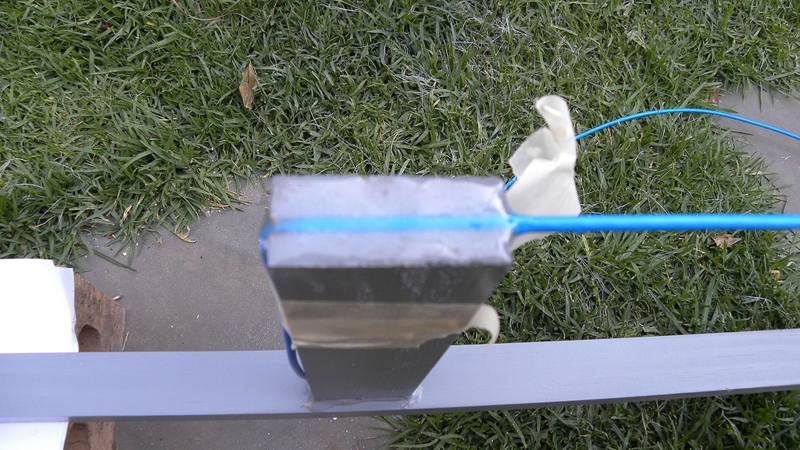 During rainy conditions the ground underneath the antenna is wet which has the effect of improving the grounding for the antenna and the parameters change. It will be necessary to compensate for this change by moving the coax feed-point on the J-Pole. A suggestion here is to find where the feed-point is ideal for dry conditions and then again for wet conditions, dividing the two feed-point distances by two and mounting the coax at this half-way point permanently. This is not ideal and the effective, usable 1:1.5 VSWR band width of the antenna around the centre frequency, taking into account both dry and wet conditions, is basically halved, i.e. from 700 kHz to about 350 kHz, but at least a compromise is reached. After experimentation I found this point to be 0.260 meters from the bottom of the antenna. Running this design in EZNEC produces VSWR and Radiation Pattern plots as indicated in figures 5 and 6 respectively. 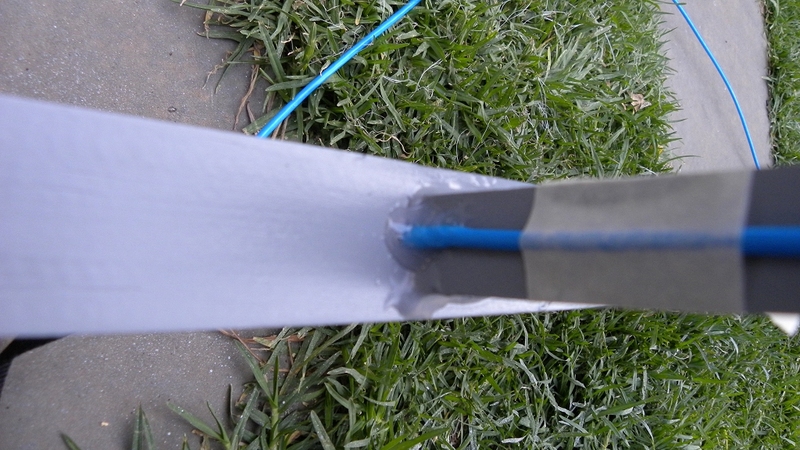 I selected average to rocky ground and PVC insulated copper wire with insulation 0.4 mm thick in the simulation. The antenna was placed 3.6 meters above the ground. The results indicate that the theoretical VSWR and the VSWR I measured are very similar and the take-off angle is between 12 and 13 degrees (the actual take-off angle may be lower as the antenna is mounted next to a house built with concrete and bricks, thus the gain should also be higher). Figure 7 shows the EZNEC antenna model and current distribution curves. Before tuning, ensure the coax cable transmission line is cut to a length which uses multiples of 0.5 wavelength because each 0.5 wavelength of cable represents the characteristic impedance of 50 ohm. Also take the velocity factor (VF) of the cable into account. The VF for RG58/U Solid Polyethylene (inside insulation: transparent) is 0.66 and for Foam Polyethylene (inside insulation: white) is 0.78 respectively. Solid Polyethylene coax cable one 0.5 wavelength long is 3.600 metres. The calculation (in metres) is as follows: 300 / 27.500 x 0.66 / 2 = 3.600 m. This length does not include the extra coax cable required for the Balun, it is only the length of the coax cable transmission line from the Balun to the receiver or transceiver. 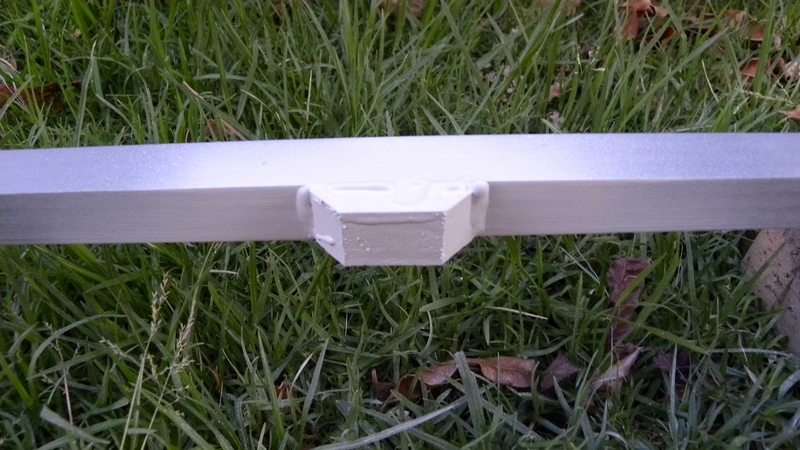 The wood mast to which the antenna is mounted must be painted with non-metallic primer and paint. The sections of wood should be glued together with waterproof glue, epoxy adhesive is ideal and it cures fast leaving a waterproof join that is strong. Join sections of wood starting with a large diameter and ending with a smaller diameter (refer to figure 4). As the mast tapers towards the top it is important to insert spacers between the mast and the antenna to ensure the antenna remains straight and parallel to the 0.25 wavelength matching section. 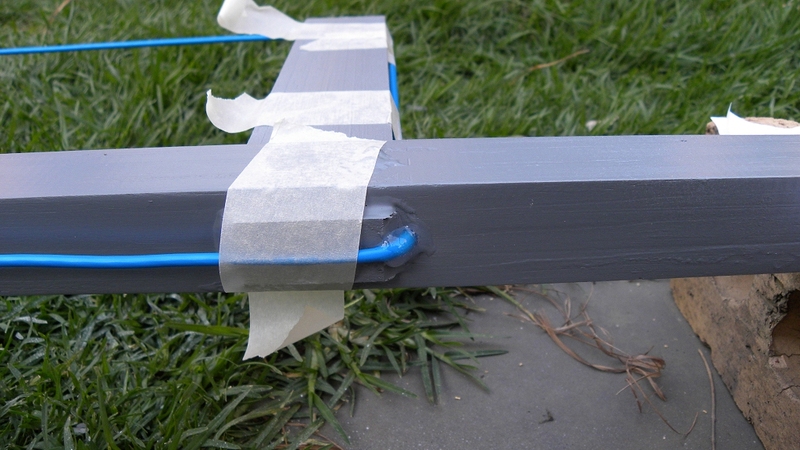 Cut slots into the spacers and struts into which the wire can be inserted and glued in place using epoxy adhesive. The wire should be pulled as straight as possible when mounting it to the wood mast. Strip back about 1 cm of insulation from the top section of wire where it connects to the top of the mast and top of the 0.25 wavelength section top ensure the epoxy adhesive comes into contact with the copper wire, otherwise when glued to the insulation only, the insulation will stretch and the antenna wire will become saggy over time. 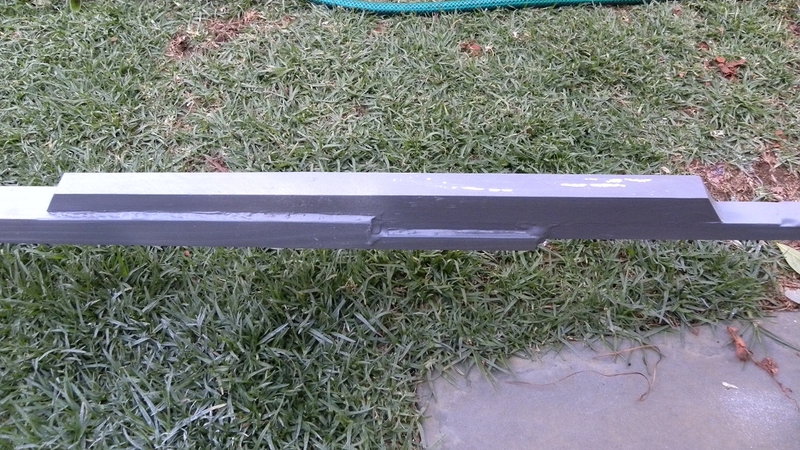 Also, bends in the wire will distort the radiation pattern of the antenna. For safety, use at least 6 gut line stays to keep the antenna up straight (three at the top of the antenna and three about mid-way down). Wind loading on the antenna is high enough for it to bend and snap in windy conditions. When installing the antenna it is best to do so on a windless day. A slight breeze is also acceptable, but be careful as a sudden gust can snap the mast. Install the antenna half-way up standing on the ground. Clamp the mast to the mount temporarily. Extend the 6 gut line stays out and tie them to where they will be tied permanently. Leave enough slack so that the antenna can be pushed all the way up and the stays are slightly taut (doing so should minimize the chance of the antenna falling over or snapping). Use the Theorem of Pythagoras to calculate the length of each stay. Remove the clamp and push the antenna up. Mount in place. Adjust the tension on the stays so that the antenna is perfectly straight and perpendicular to the earth. As with most antennas, try to install the antenna as far away as possible from surfaces and objects that reflect RF. Important: Do not install the antenna near power lines or where it will cause damage to property or hurt people and pets should it fall over for any reason. To prevent lightning damage, disconnect the antenna from your receiver/transceiver when not in use.